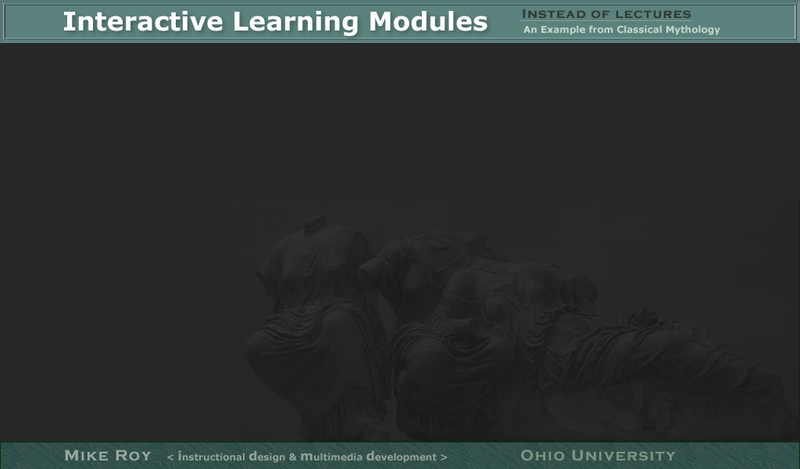 I created eighteen 15-minute modules. 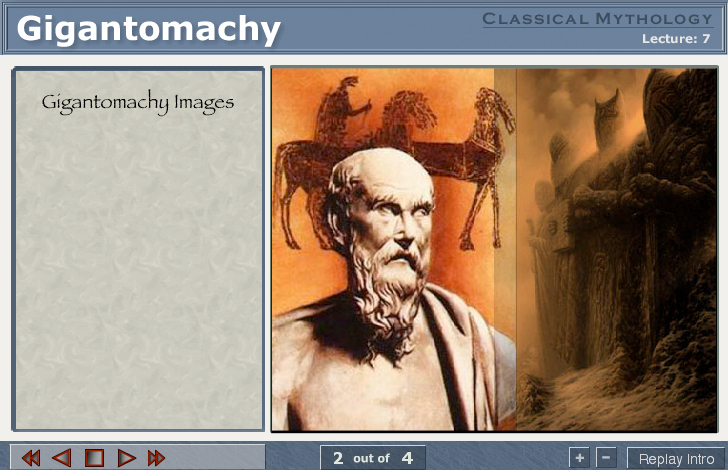 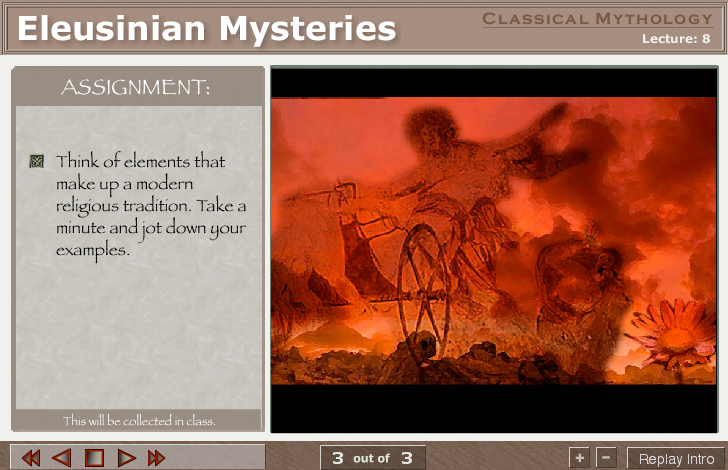 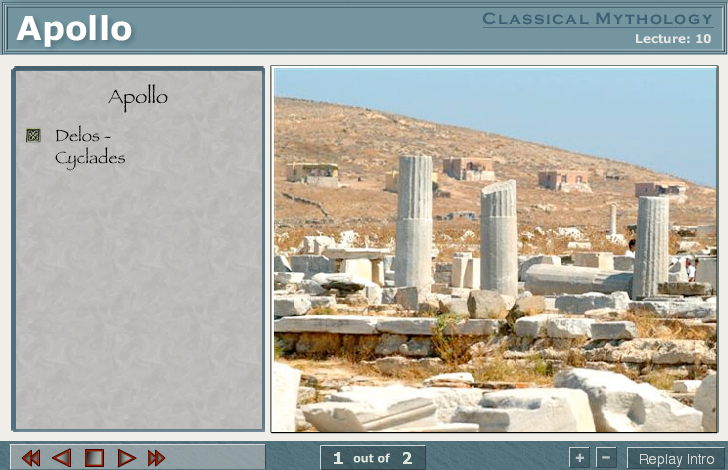 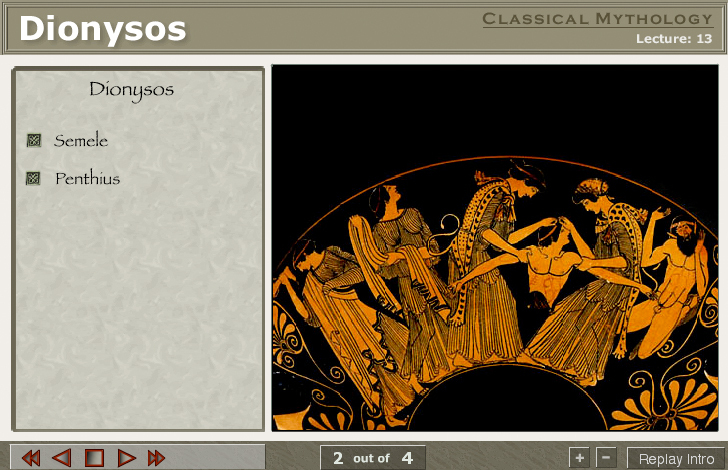 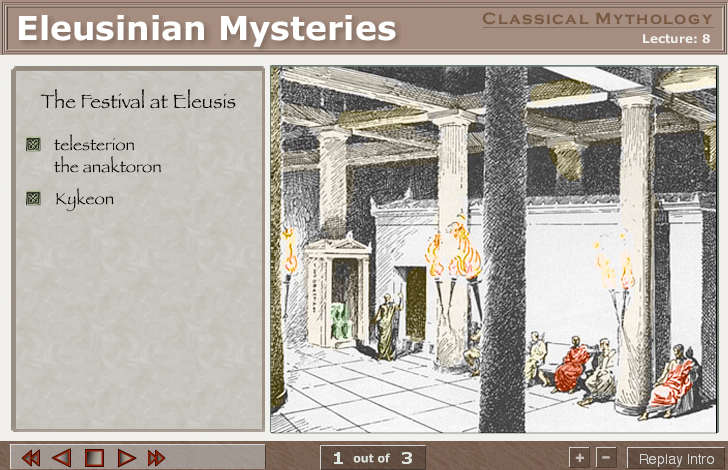 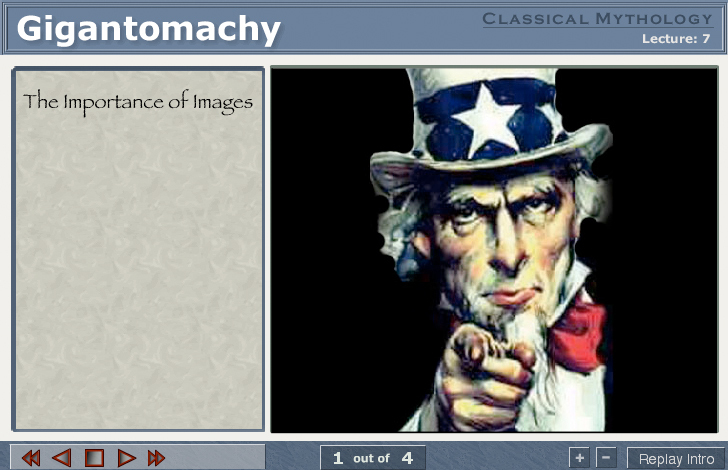 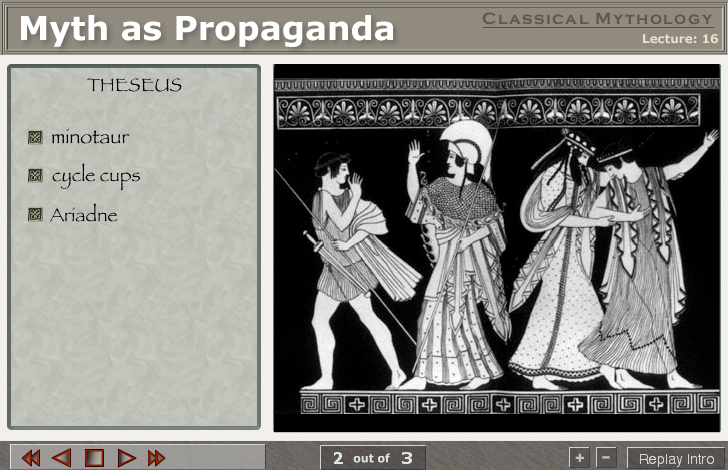 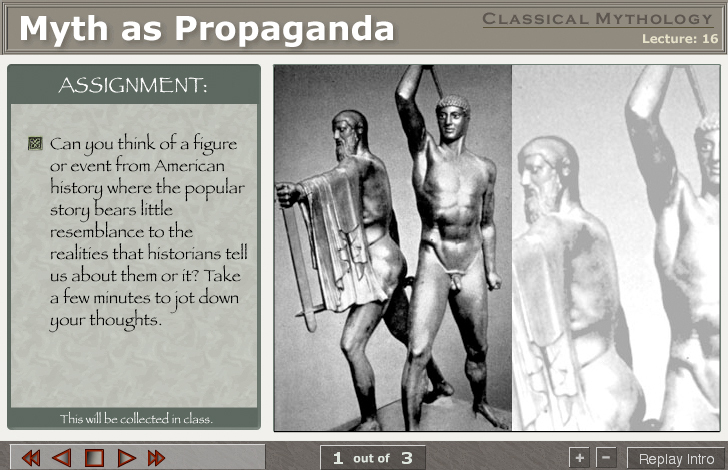 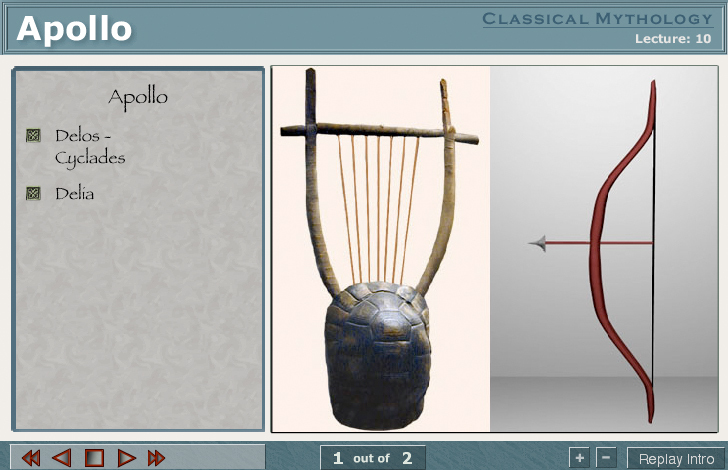 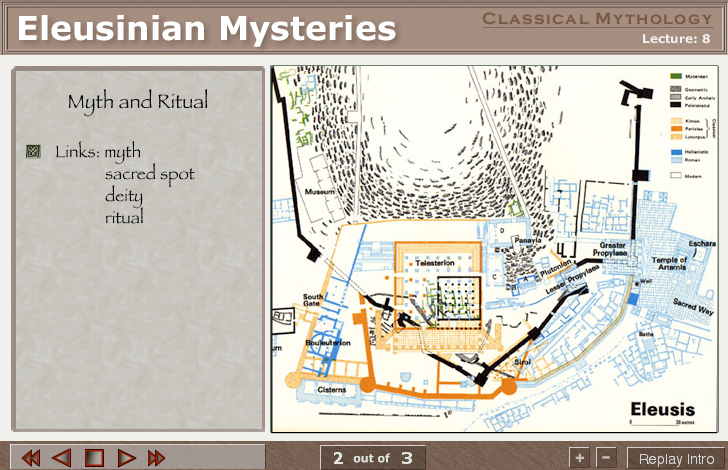 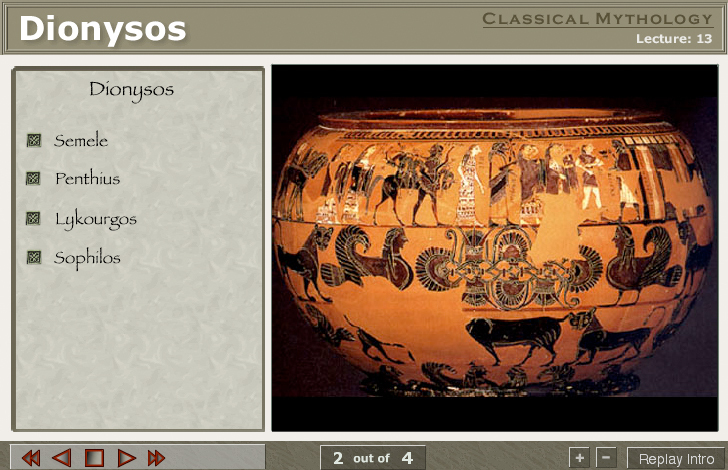 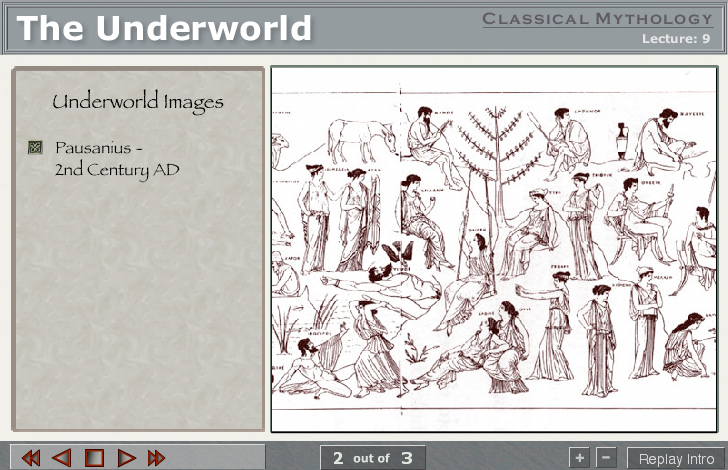 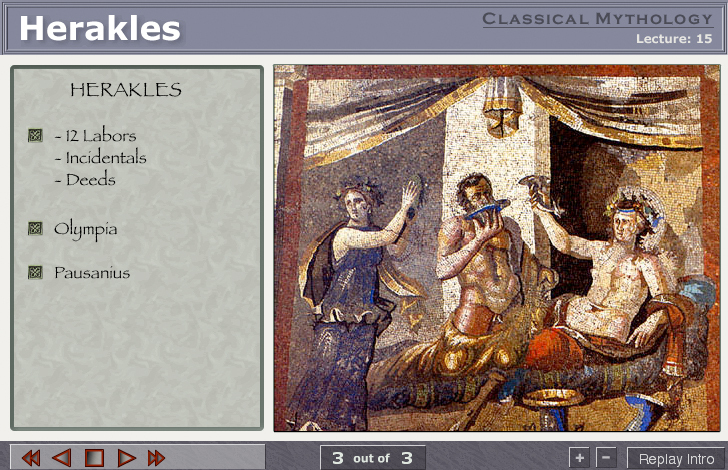 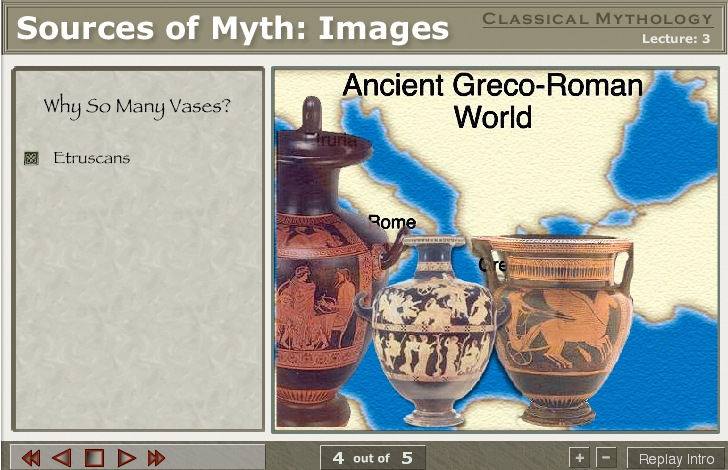 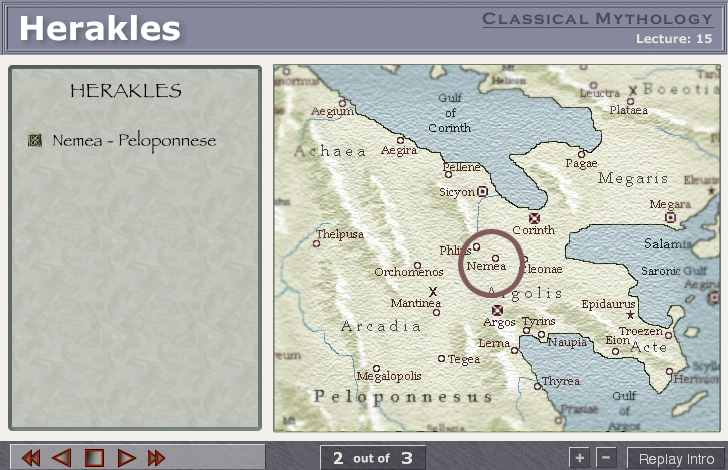 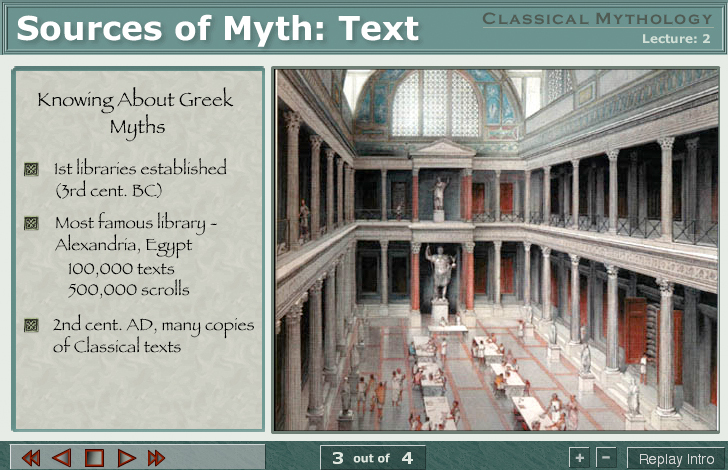 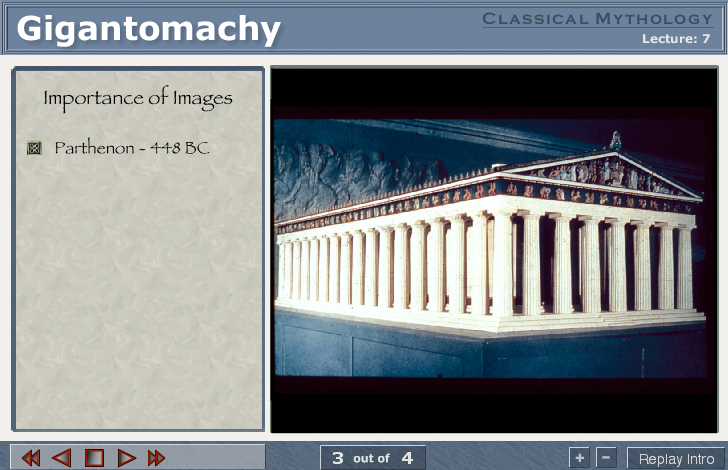 Each module includes a narration with graphics, diagrams and illustrations from ancient art. 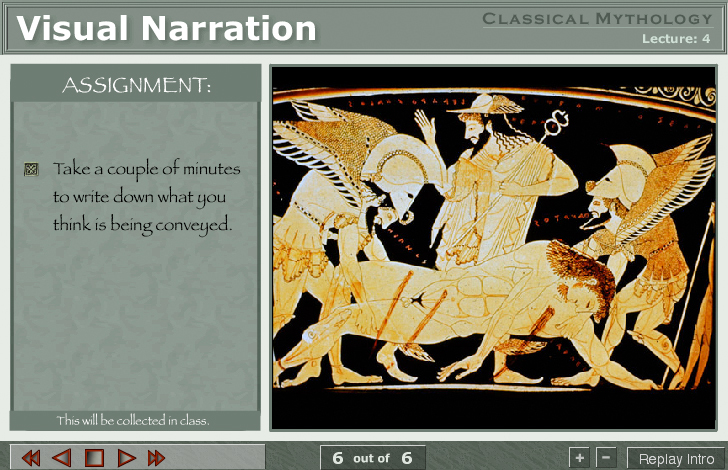 At several points during the module, the narration pauses and students are requested to respond in writing to questions; their responses are evaluated by the instructor. 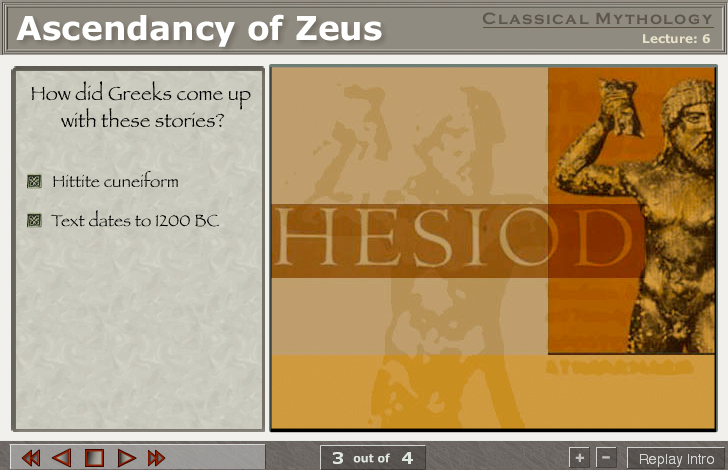 Students may watch the presentation as many times as they want and then are required to take an on-line quiz based on the material in the module. 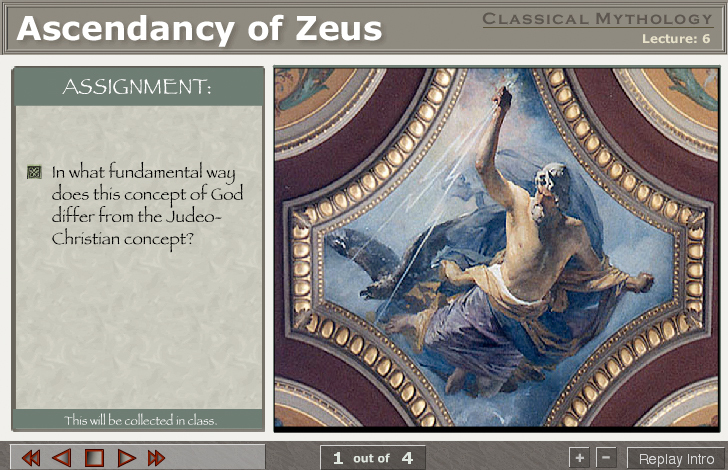 THE COURSE: The course included regular reading assignments, learning modules, and class discussion. 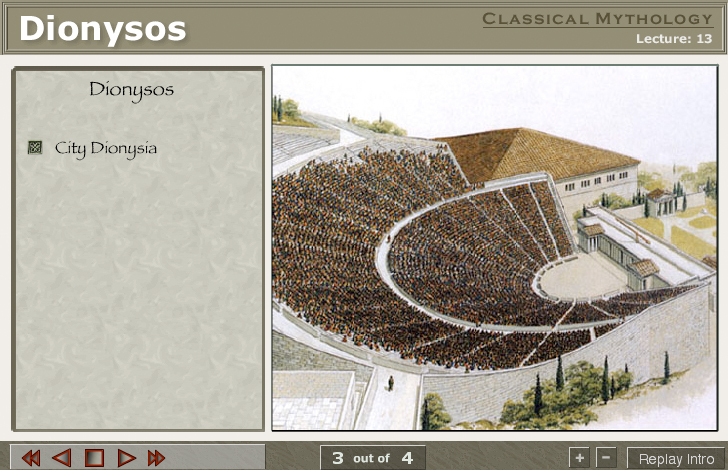 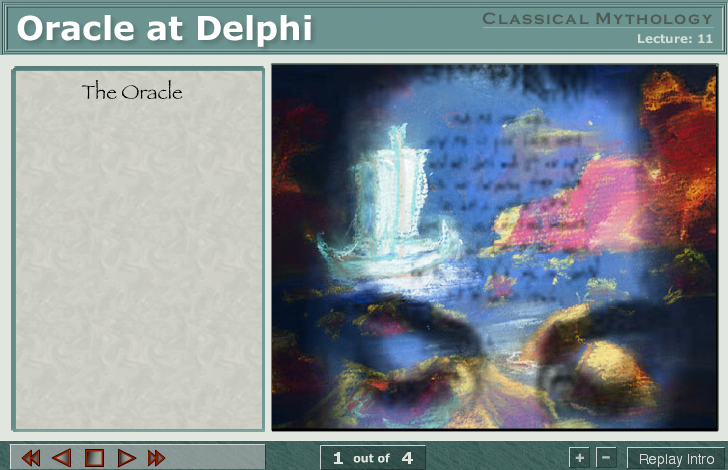 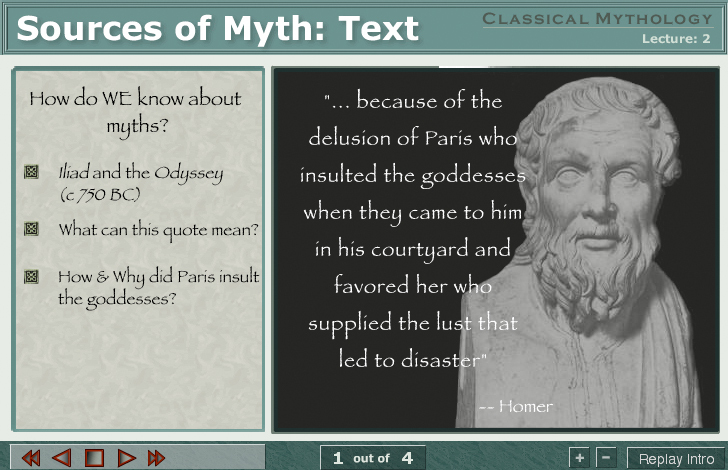 Interactive learning modules allowed Ohio University to offer twice as many sections of a popular, undergraduate Classical Mythology course without increasing class size, adding to the instructor’s workload, or taking away from class discussion time. 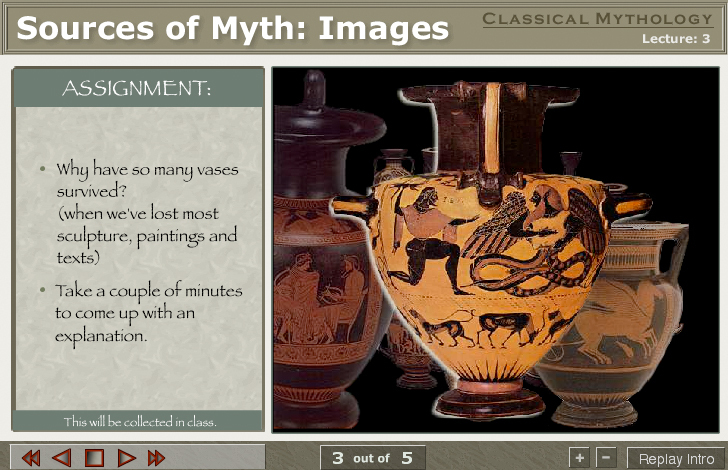 The class met four times per week. 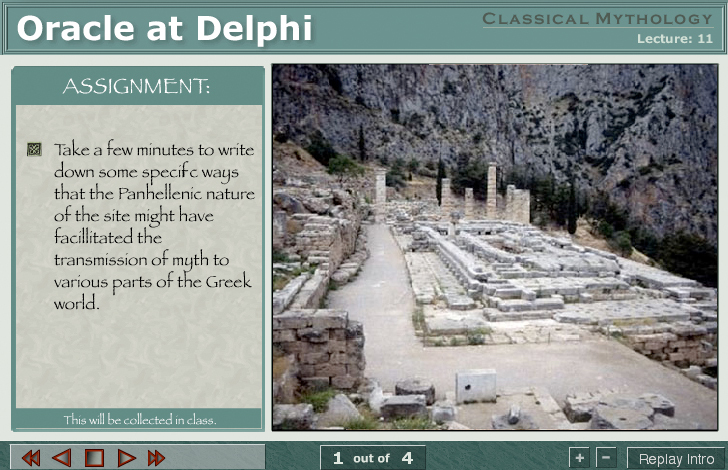 Two classes were replaced by modules with the attendant written assignments and quizzes (roughly 40 minutes). 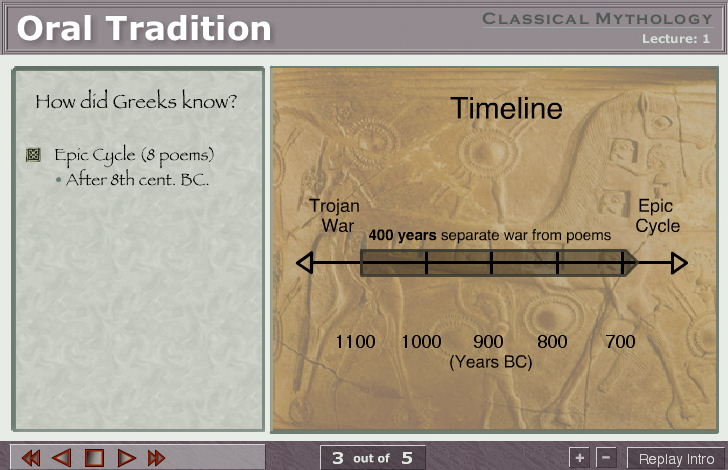 Thus, one instructor was able to teach 60 students yet have groups of a size where discussion is possible by dividing the class in two and meeting each half twice a week. 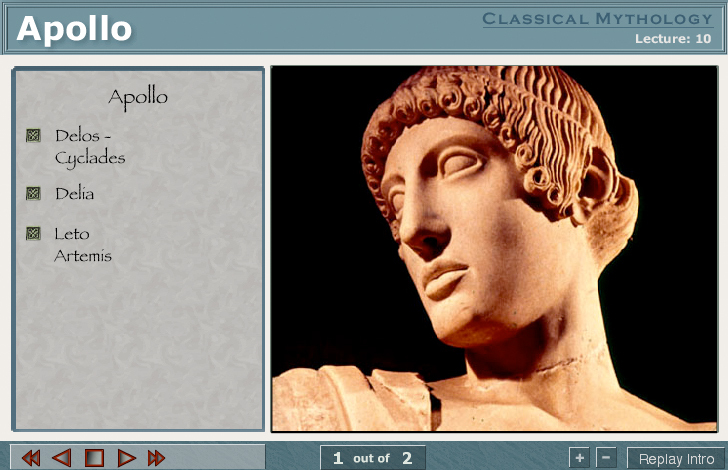 OUTCOME: We administered two assessments to two sets of students: a likkerd test, and a short answer essay evaluation. 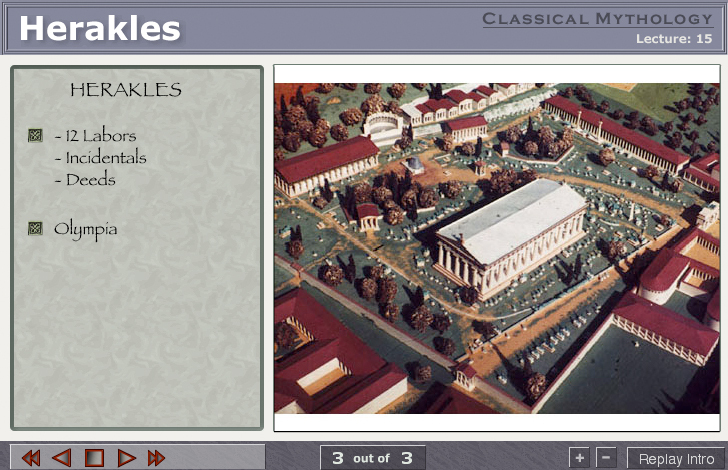 Then, when Tom had to travel out of state, our IT design team, Mike Roy, Project Manager, and Jody Sugrue, graduate student, held an rap session to talk about students’ perceptions about what they liked or didn’t like about using the web modules. 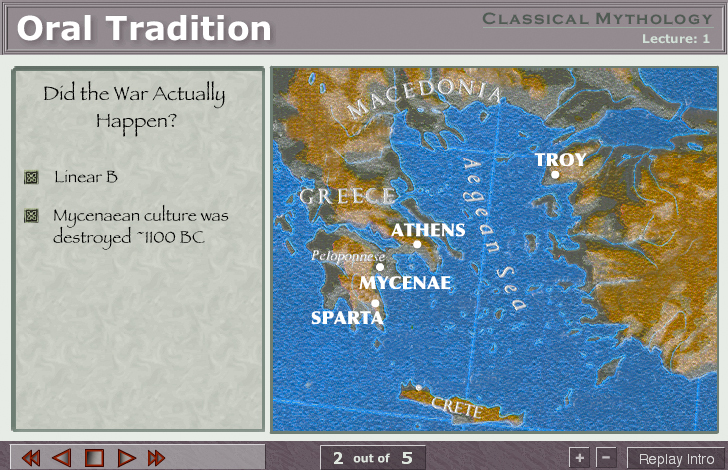 There was a free and lively discussion that was overwhelmingly positive. 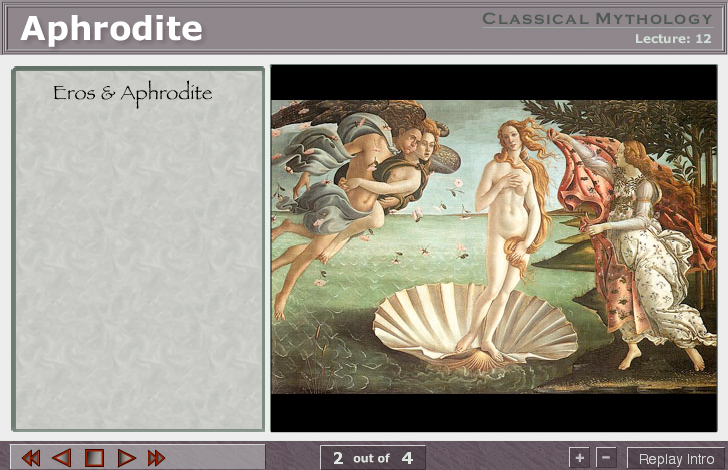 Students felt that they learned better working through the web modules than when listening to an in-class lecture. 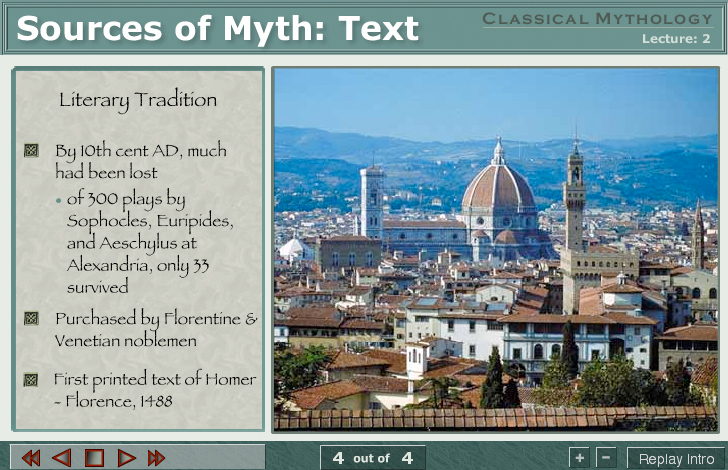 They reported that they often repeated a section to a module and understood the material better than a traditional lecture. 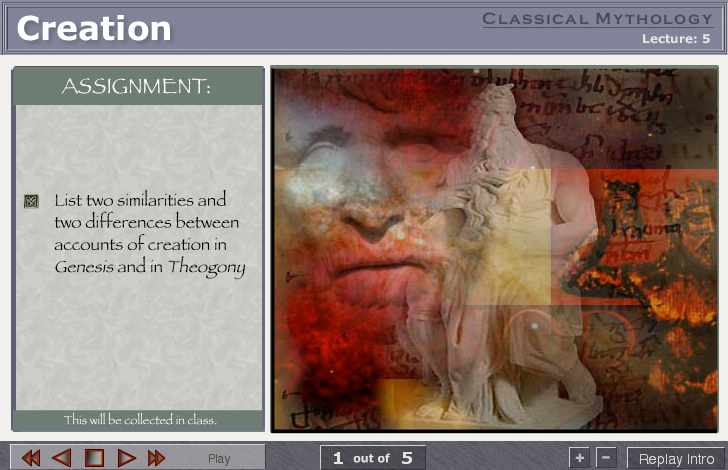 We also interviewed Tom for his perspective on the outcomes of this project. 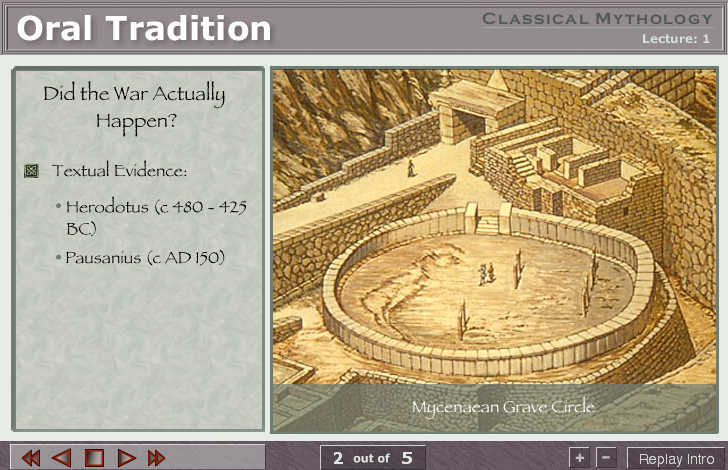 Tom reported improved interactions with students and that class discussions were more substantive as a result of this approach. 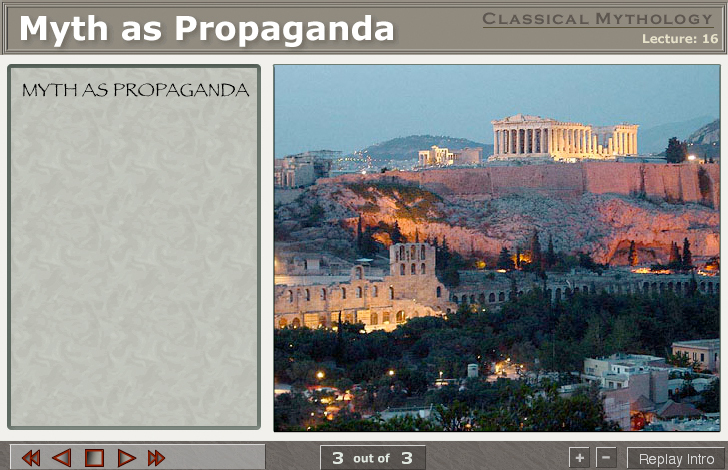 He said that teaching two sections of 30 students instead of one not only earns more money for his department, but that it allows them to teach more students without losing interaction in a small group discussions. 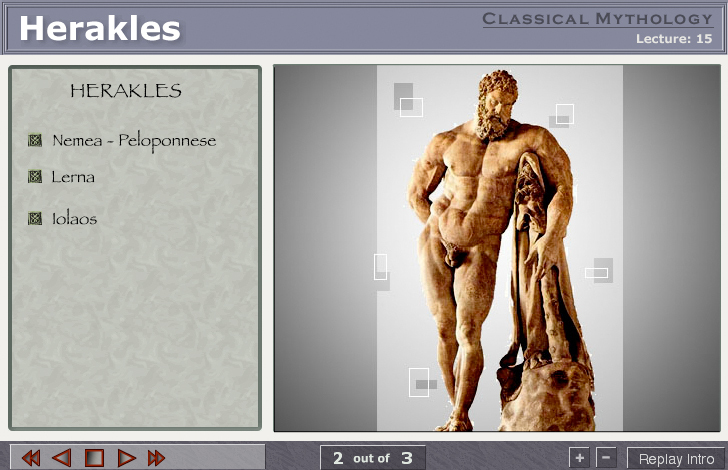 He suggested that online modules can teach better than in-class lecture. 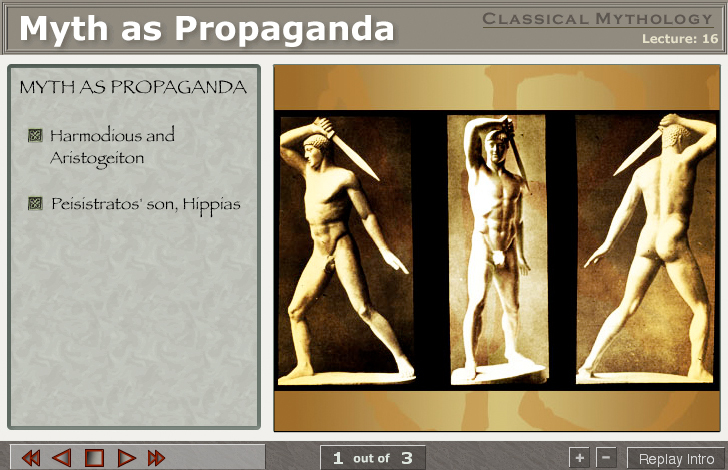 While scripting and recording the narration for the web modules, Tom continued to give traditional lectures to his students. 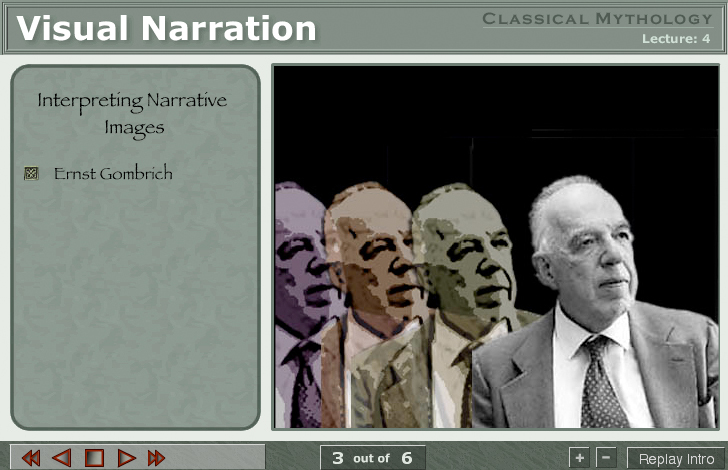 He observed that the narrative script of the web modules are edited, reviewed and revised into sharp, tightly-focused, clearly-articulated essays. 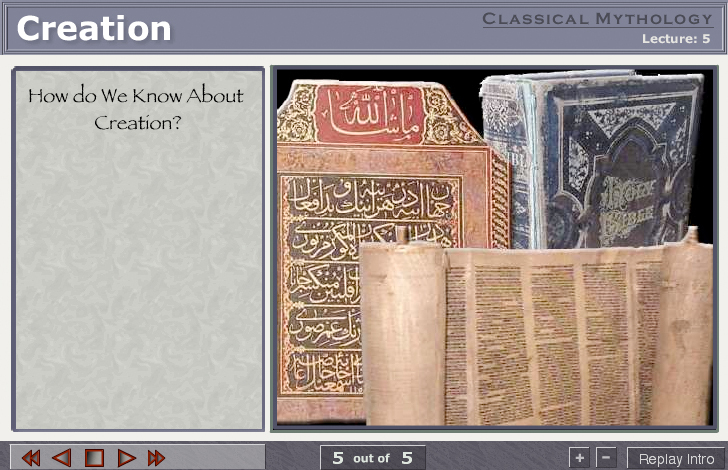 So they are easier to understand and learn from. 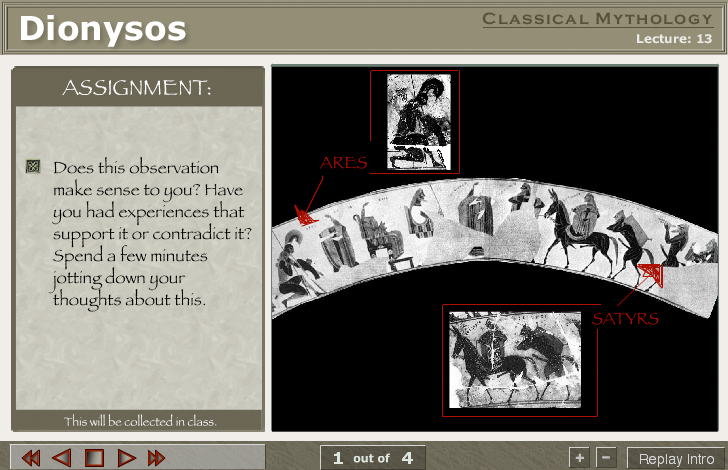 Also, the web modules give more control to students regarding the pacing and delivery of the material. 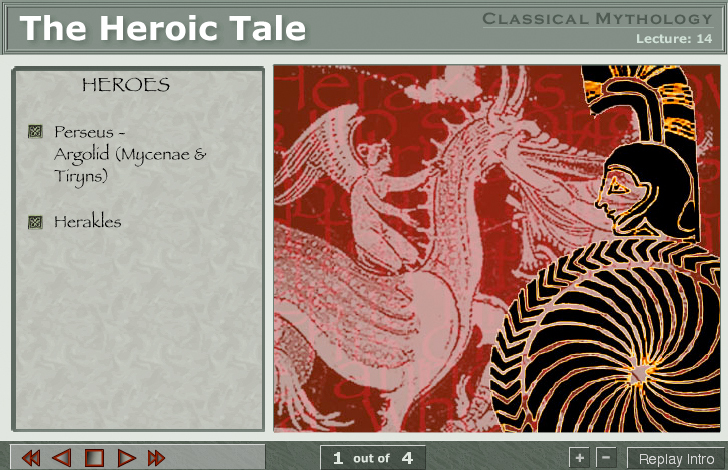 TOOLS USED: The modules were built using Adobe Flash. 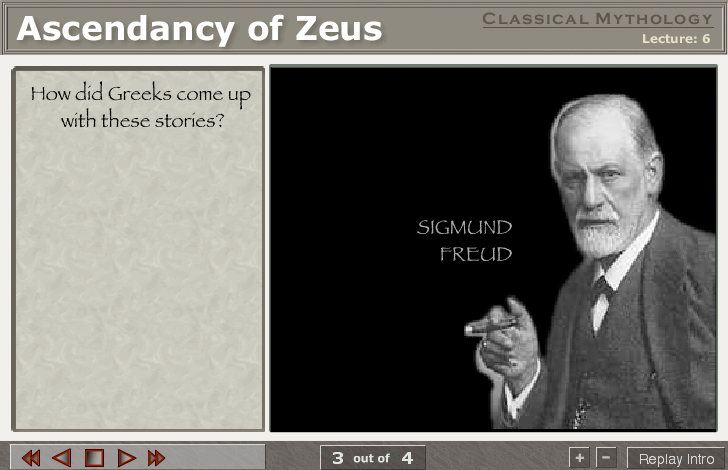 The lectures were recorded using Audacity. 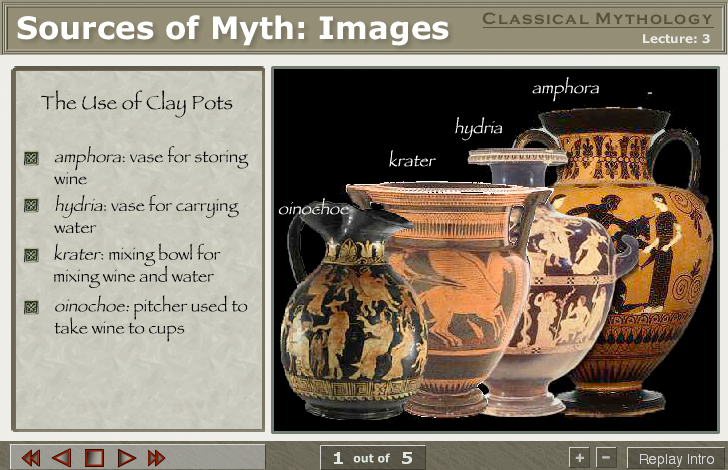 The still image and graphics were created and edited using Adobe Photoshop. 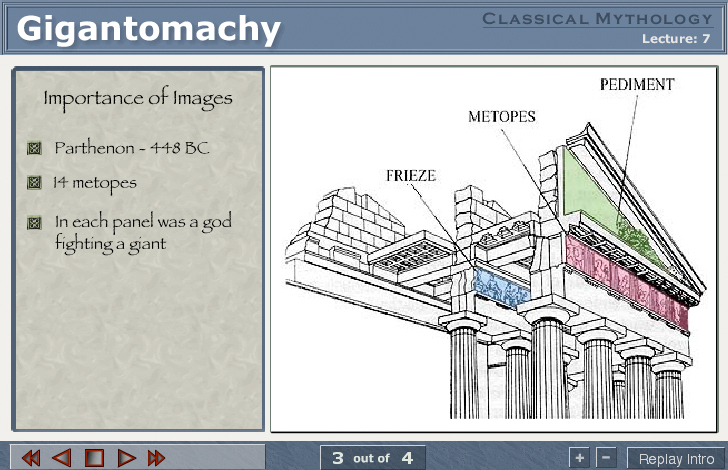 I recently re-designed the interface using Articulate 360. 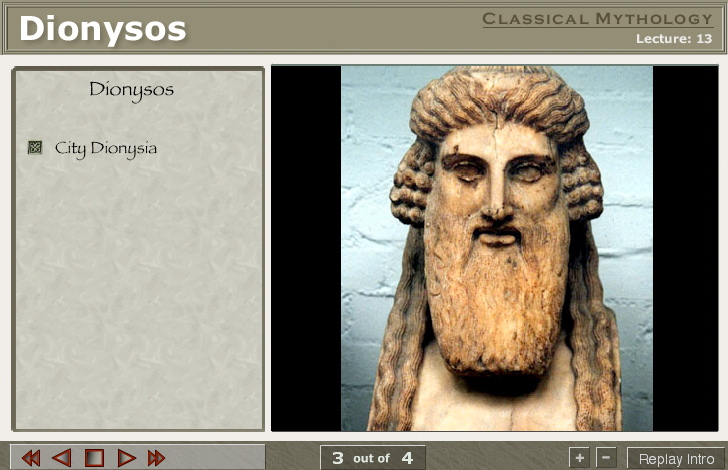 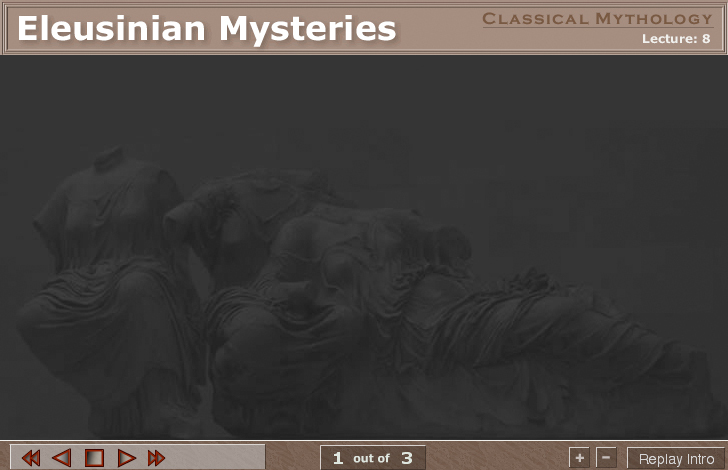 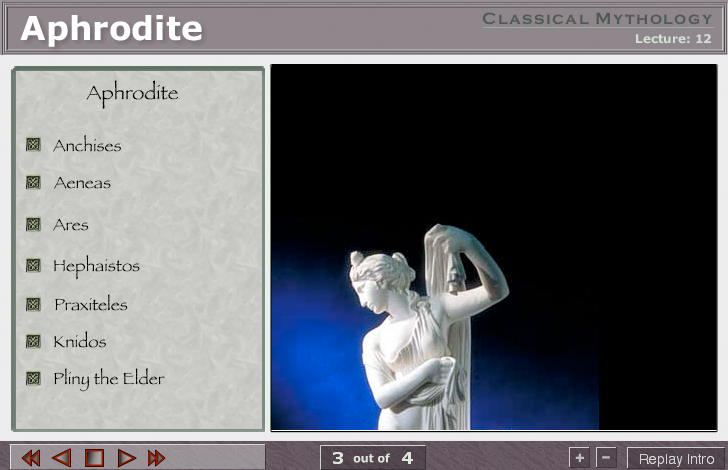 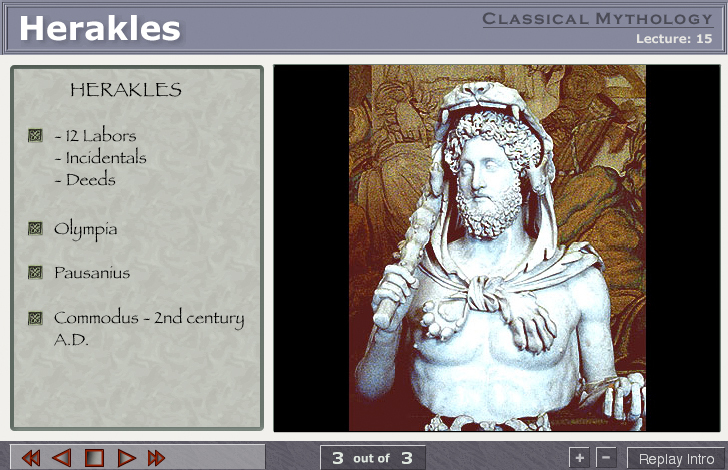 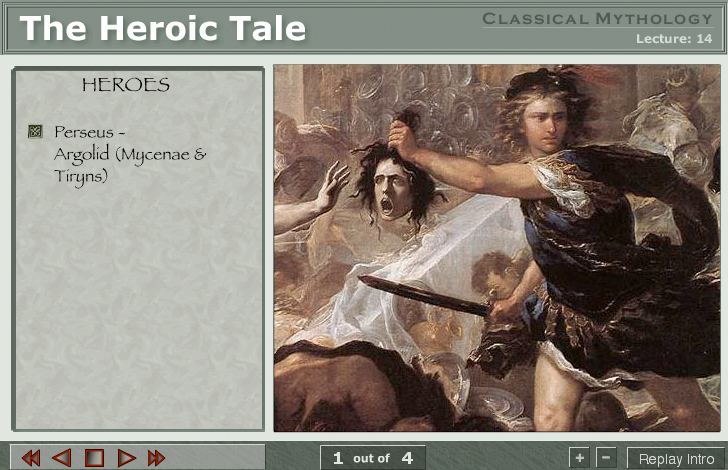 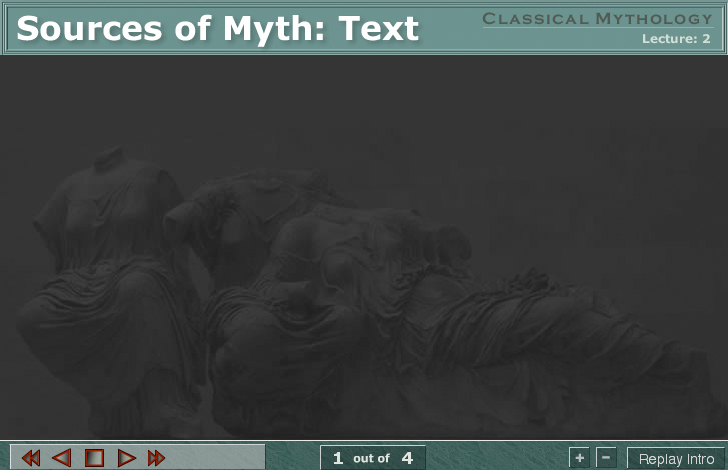 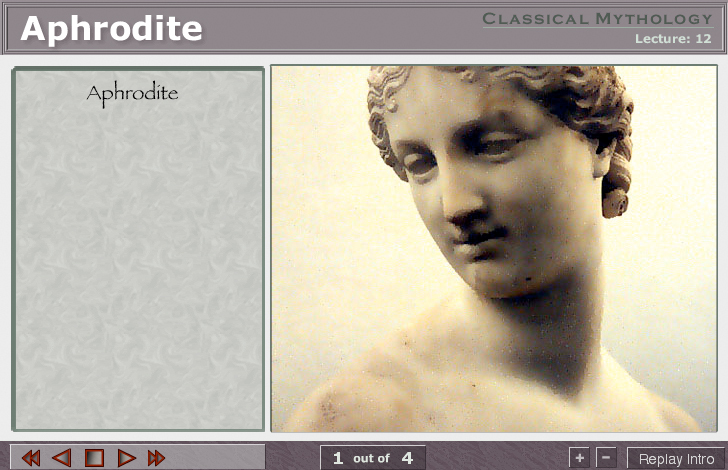 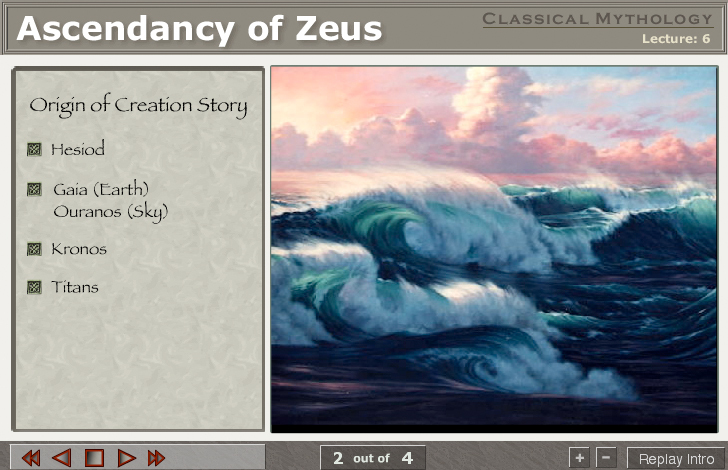 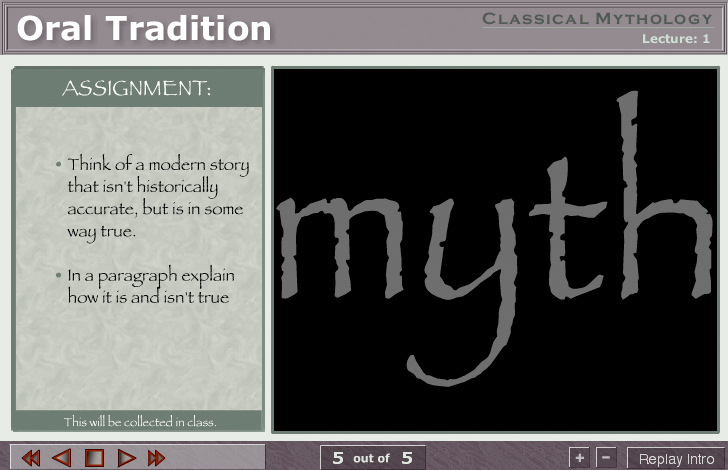 You can view all the modules at the Classical Mythology website.